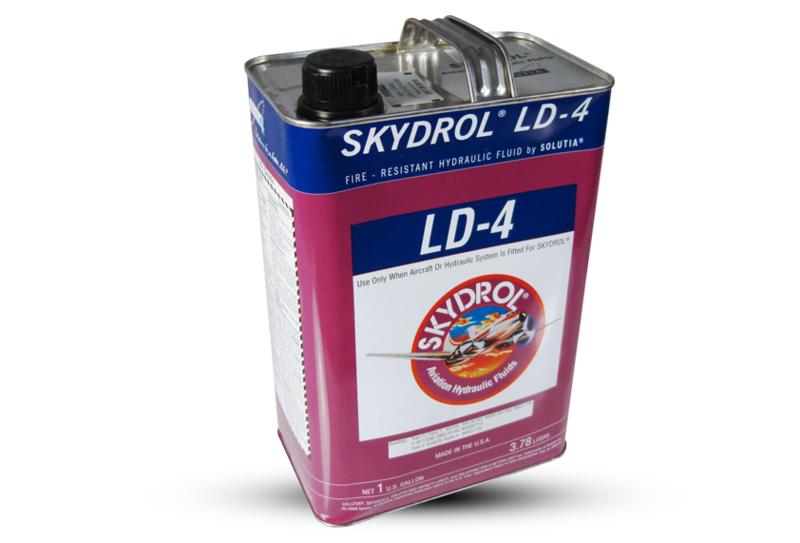 Storage and Shelf Life of Skydrol Fluids -Improper storage of hydraulic fluid can result in water and dirt contamination of the fluid which eventually ends up in an aircraft hydraulic system. This can cause premature failure of the fluid and corrosion of system components. By following proper storage and transfer procedures of the hydraulic fluids, the contamination problem can be eliminated. • Store drums indoors whenever possible, and always keep lids securely tightened except when transferring fluid. Smaller containers such as 5 gallon, 1 gallon and quart cans should be stored indoors only. • When transferring fluid, take care that pumps, filters and transfer lines are clean and dry. • Store drums horizontally, if possible, to prevent water collection on the drum lid. If the drums cannot be stored horizontally, they should be blocked up and tilted so that any water collection on the lid will not cover the bungs. • For all size containers, the use of pallets, racks or shelves is suggested to prevent contact with ground moisture. • Fluids should be sampled and analyzed whenever there is a question of useability. 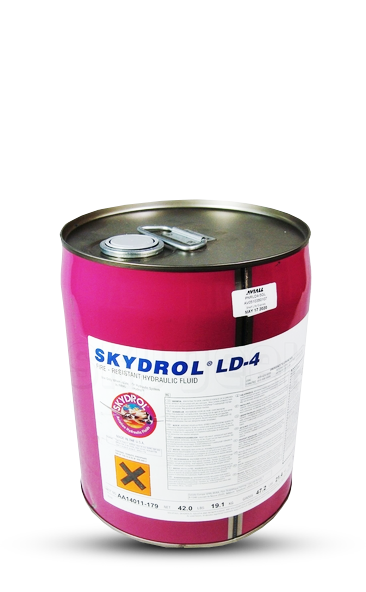 • The shelf life of all Skydrol hydraulic fluid is five years from the date of manufacture. This applies only to factory-sealed, unopened containers with proper storage. Handling of Skydrol Fluids - Skydrol hydraulic fluids are based on phosphate ester basestocks, which are good solvents and plasticizers. Care should be taken in handling Skydrol fluids to keep them from spilling on certain plastic materials and paints, which might tend to soften. (See the Compatibility Table on pages 7-9.) If a small amount of Skydrol fluid is spilled during handling, wipe it up immediately with a dry cloth. When large pools form, an absorbent sweeping compound is recommended. Then remove any traces of fluid ith an approved solvent (see list on page 23). Finally, wash the area with water and a detergent. Tools should not be allowed to soak in Skydrol fluids if they have painted areas or polyvinyl chloride (PVC) plastic handles. Many nonmetallic materials are resistant to Skydrol fluids and will not be adversely affected by it. The Compatibility Table on pages 7-9 should be consulted. Since it is difficult to visually distinguish between materials that are resistant and those that are not resistant, it is highly recommended that all materials wet with Skydrol fluids be wiped off and cleaned as soon as possible. shoes may soften and deteriorate when exposed to Skydrol fluids. you in answering questions regarding Skydrol hydraulic fluids.